Art games, or “walking simulators”, deserve more of a chance than most gamers are willing to give. Sometimes a story is best told with the immersion and interactivity of a video game, even if that interactivity is as minimal as walking and examining objects. Sometimes traditional gameplay just doesn’t fit into that vision. Just because something could be a movie or book does not mean it needs to be. Perhaps it’s true that they shouldn’t call themselves games with only nominal gameplay, but not wearing the title of “video game” doesn’t make them any less legitimate a pastime than those programs that do. I say all of this to convey how little knee-jerk dismissal is involved in the following statement: Into Blue Valley is a complete waste of time. Do not spend money on it. 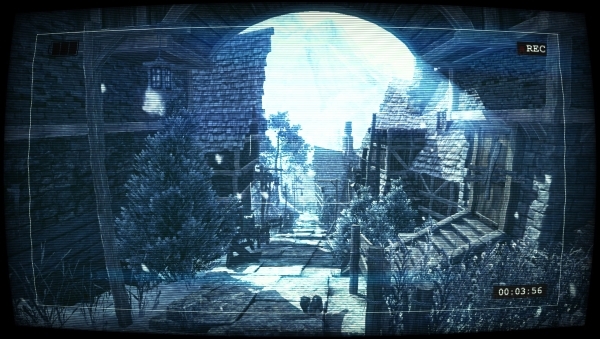 The game’s primary gimmick is its “found footage” style, wherein the player’s trip to the deserted, snow-covered village of Blue Valley is presented as a VHS recording being watched by two unseen characters. The idea of the viewer’s perspective being an actual camera held by an everyday person has been done to death in film, but it still has a lot of potential for games…none of which is tapped here. The camera trick does nothing to enhance the gameplay or narrative. It merely allows two hollow shells masquerading as characters to narrate the game in the most banal, heavy-handed method possible. Imagine Bastion’s procedural narrator without the voice acting, diluted down into as few lines (and even fewer interesting lines) as possible. The lack of voice acting is especially damning in this genre, which demands immersion and artistry. Its absence means that about once a minute, what little momentum the game had grinds to a halt as the player attempts to read poorly-disguised instructions from the tape’s audience. Voice acting isn’t the only important thing the game’s budget excluded, either; there are only one or two sound effects in the entire game, and footsteps isn’t one of them. The game doesn’t even bother with scene transitions or animation of any kind – just click a door and wait through a second of camera static, and the protagonist magically appears inside the building. The 3D models are at least competently constructed, but it’s rather hard to ignore how conspicuously two-dimensional the abundance of foliage is. The game is one of the laziest and least immersive Dear Esther imitators on Steam – and that’s a category with quite a bit of competition. The first-person controls feel like unedited example code that shipped with the game’s engine, so the player’s movement is hampered by every two-inch-high rock they encounter. Furthermore, despite the game’s billing as an “exploration game”, any deviance from the story’s already heavily fenced-in path will be cut short by a wave of invisible walls. There is precisely one fork in Blue Valley’s road, and completing the game requires taking one direction all the way, retreating back to the fork, and then taking the other direction. Finally, any remaining hope of immersion in the experience is quashed by the giant, glowing instructions hovering over each important object. As underwhelming as Into Blue Valley’s narrative is, focusing on it instead of any kind of gameplay was probably the best decision, because every instance of traditional game design the game showcases is downright stupid. In addition to the aforementioned unnecessary backtracking, the game uses an unintuitive system where notes are only readable while the mouse button is held over them, rather than just clicking on notes to read them and clicking again to close them. The game’s love of the colour blue is even more ridiculous. 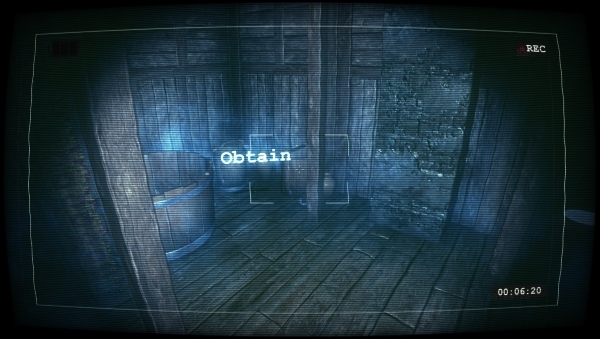 For unexplained reasons, every inch of the setting is coated in a blue aura, and plot-relevant items are highlighted with a slightly deeper blue haze. You read that right: important objects are “highlighted” using the same colour as everything else. There are precisely two moments during Into Blue Valley’s brief runtime that made me feel it could have been something more. The first was a comment from one of the narrators regarding my attempts to open a locked door. The second was a recurring (and plot-relevant) visual phenomenon that the narrators never commented on, leading me to believe that only the protagonist (and by extension, I) could see it. Both of these, if fleshed out, could have been excellent uses for the “found footage” gimmick, but neither ever amounts to anything. The narrators never utter anything as clever as the door comment again, and the unsettling feeling that they and the player are seeing different things is ruined when the previously-ignored phenomenon returns in the ending, suddenly acknowledged by the narrators.